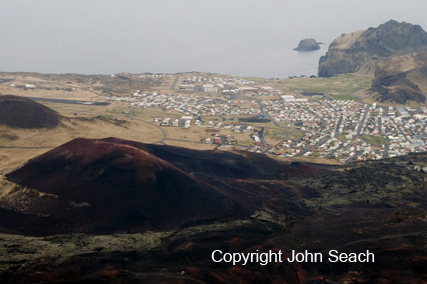 Vestmannaeyjar Volcano is a group of islands off the south coast of Icelend. 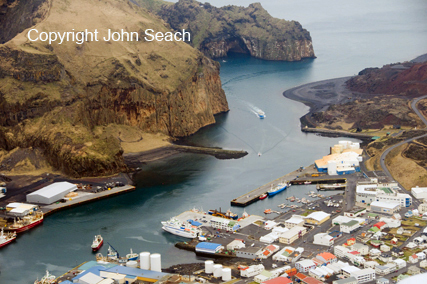 Two famous eruptions occurred at Surtsey in 1963 and Heimaey in 1973. Surtsey eruptions began 130 m below sea level, and reached the surface in November 1963. Eruptions continued until June 1967 when it had formed an island with an area of 2.7 sq km. Erosion had reduced the island size to 1.4 sq km in 2007. The island was declared a nature reserve in 1965, and this has allowed the study of colonisation of new land by plants and animals. 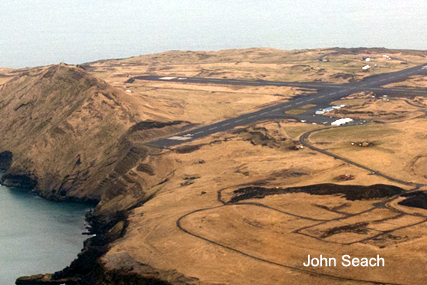 Heimaey is the largest island in the Vestmannaeyjar group, and the only one with population. A fissure eruption began at Heimaey on 23rd January, 1973. A curtain of fire erupted 300-400 metres from Kirkjubæir, the most easterly houses in the town. The eruption ended on 3rd July, 1973. In six months a cone 225m high was formed and 360 houses buried. 1973 (Heimaey), 1963-67 (Surtsey), 1896 (near Hellisey), 1637-38 (near Heimaey?). Older eruptions are not accurately dated.